Pain is one of the general manifestations of inflammation, as inflammatory cytokines and mediators sensitize primary afferent neurons to subsequent stimuli. Specific medical treatment is critical in dealing with it properly . To understand the concept of pain, it is important to recognize that pain which occurs after various noxious stimuli is often protective and quite distinct from the pain caused by significant damage to tissues or nerves . The main characteristic of inflammatory states is that usually harmless stimuli produce pain ,. At present, most anti-inflammatory drugs are effective in inhibiting inflammation, but have many serious side effects such as stomach ulcers, gastrointestinal bleeding, and cardiovascular effects. These limitations have driven drug researches to develop new pain therapies ,,. Natural products and their derivatives have been recognized for many years as sources for new therapeutic agents, as new treatments are considered important in overcoming the existing adverse effects in the treatment of pain ,. Naringenin, an aglycone of naringin, is a predominant flavanone glycoside found in grapes and citrus fruits [Figure 1]. Orally administered naringin needs to be hydrolyzed by intestinal bacteria to naringenin before being absorbed . Naringenin has many pharmacological properties such as antidyslipidemic, antiobesity, antidiabetic, antimicrobial, and anticancer effects ,,,,. Recently, it was also found to have potential for immunomodulatory efficacy, which could be associated with suppression of the activities of mast cells, macrophages, dendritic cells, and T cells ,,,,. 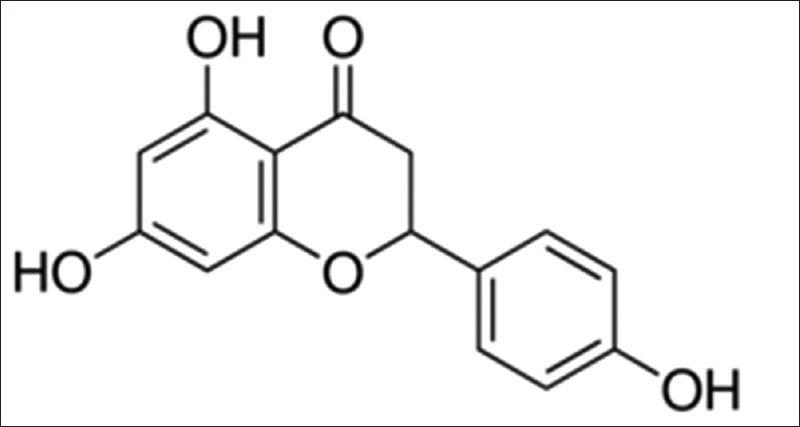 Therefore, naringenin has been proposed for potential pharmaceutical application in rheumatoid arthritis and osteoarthritis ,,. Although these findings demonstrate the anti-inflammatory potential of naringenin, little is known about its possible antinociceptive activity. Hence, in the present study, we further investigated the antinociceptive activity of naringenin in experimental models. Male BALB/c mice (20 ± 2 g) and male Sprague-Dawley rats (150–160 g) were purchased from the National Laboratory Animal Center (Taipei, Taiwan). The mice were fed sterilized mouse chow and water. All animal experiments were conducted in accordance with the Laboratory Animal Management and Ethics Committee of National Chung Hsing University. Animals were randomly divided into five groups. Animals in Group I were treated with corn oil (Sigma-Aldrich, St. Louis, MO, USA) as the vehicle control. Animals in Groups II, III, and IV were orally administered 50, 100, and 200 mg/kg naringenin dissolved in corn oil (Sigma-Aldrich, St. Louis, MO, USA), respectively, using oral gavage needles. Animals in Group V received standard pain-relieving drugs, such as codeine, aspirin, or ibuprofen, as positive controls, where indicated. All experiments were approved according to the guidelines of the Laboratory Animal Care and Use Committee of National Chung Hsing University, Taiwan. Animals were administrated naringenin orally once daily for 1 or 2 weeks before the hot-plate test and abdominal writhing test. The mouse was placed on a hot-plate apparatus (UGO, Basile, Italy) with a temperature of 55°C ± 1°C, and the latency was measured. The latency is an index of the pain threshold, defined as the period of time from when the mouse was placed on the hot plate to the first sign of lifting or licking its hind paws, or jumping from the surface to avoid the heat. The total time would not exceed 60 s to avoid further injury to the animal. Mice which received 10 mg/kg codeine (Sigma/RBI, Natick, MA, USA) were the positive controls . This test has been described previously . Briefly, mice were injected intraperitoneally with 0.7% acetic acid (0.1 mL/10 g) (Merck, Darmstadt, Germany) solution. The numbers of writhing responses in the mice, particularly manifesting as abdominal muscular contractions and hindlimb stretches, were counted during a 20 min period after acetic acid injection. The data express the total number of responses observed over the 20 min. Mice which received 100 mg/kg of aspirin (Sigma-Aldrich, St. Louis, MO, USA) intraperitoneally were used as positive controls . For the tail-flick and paw edema tests, animals were treated with naringenin once before the respective measurement. In brief, rats were placed on the tail-flick unit (UGO Basile, Italy), and their tails received heat stimuli generated by an infrared laser beam. The nociceptive threshold was recorded as the time from laser startup to the time the animal flicked its tail. Rats treated with 10 mg/kg codeine were used as positive controls . This method was utilized as described in a previous study with slight modifications . Carrageenan 1% (Sigma-Aldrich, St. Louis, MO, USA) diluted with normal saline was injected into the right hind paws of rats (100 μL/animal) with or without 1-week naringenin treatment to trigger paw edema. The paw volumes were measured hourly from 1 to 5 h after injection using a plethysmometer (UGO Basile, Italy). Rats given 100 mg/kg ibuprofen (Sigma-Aldrich, St. Louis, MO, USA) were the positive controls. Data were presented as mean ± standard deviation, unless otherwise indicated. The results were determined using GraphPad Prism 5.0 software (GraphPad Software, Inc., La Jolla, CA, USA). Statistical significance was examined by one-way analysis of variance, or two-way analysis of variance was used to compare multiple groups in the experiments. Data on the antinociceptive activity of naringenin in the hot-plate tests are shown in [Figure 2]. There were no significant differences between the 50 mg/kg naringenin group and vehicle group. Mice treated with 100 and 200 mg/kg naringenin had prolonged response times to the heat of the hot plate. Specifically, the average hot-plate latencies for mice treated with naringenin for 1 week were 11.8 (100 mg/kg), 12.6 (200 mg/kg), and 7.6 (vehicle) s and for those with 2-week treatment were 12.8 (100 mg/kg), 19.4 (200 mg/kg), and 8.0 (vehicle), respectively. 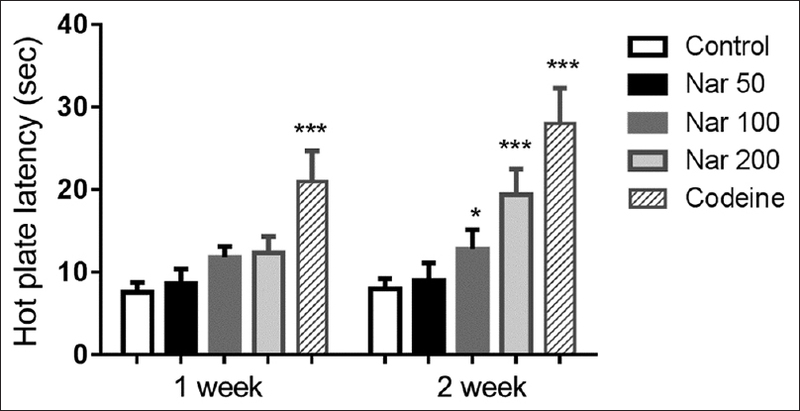 However, there was no significant difference between the 1 week and 2 week naringenin treatment groups (two-way ANOVA). The data reveal that naringenin could have antinociceptive effects on thermal nociception manifested as delayed response times. 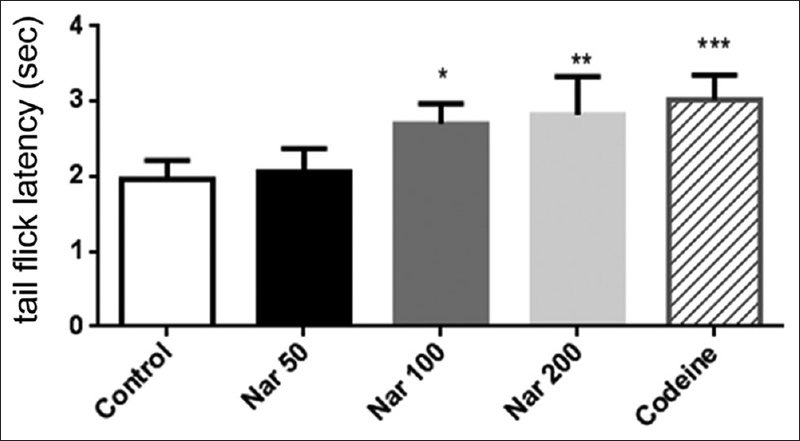 As shown in [Figure 3], oral administration of naringenin (100 and 200 mg/kg) in the test mice significantly reduced the number of muscular contractions and hindlimb stretches resulting from acetic acid-induced abdominal writhing. Control mice were administered vehicle for 1 and 2 weeks averaged 64.2 and 61.4 stretching responses, respectively, within 20 min. However, treatment with 100 mg/kg naringenin reduced the numbers to 50.6 and 48.6, and 200 mg/kg naringenin decreased the responses to 32.6 and 25.6, compared with 21.8 and 15.2 responses in the positive controls (aspirin administration). In the tail-flick tests, the durations of the reaction time (tail-flicking latency) in the 100 and 200 mg/kg naringenin treatment groups were longer than those of mice in the vehicle control group [Figure 4]. Administration of 100 and 200 mg/kg naringenin for both 1 and 2 weeks increased the tail-flicking latency an average 37.8% and 43.9%, respectively, compared with the vehicle control group rats and codeine-treated positive control group, which recorded a 54.1% increase in reaction time. The injection of carrageenan into the hind paws of rats was utilized as a model of acute inflammation. The volumes of paws with or without naringenin treatment for 1 week are summarized in [Table 1]. 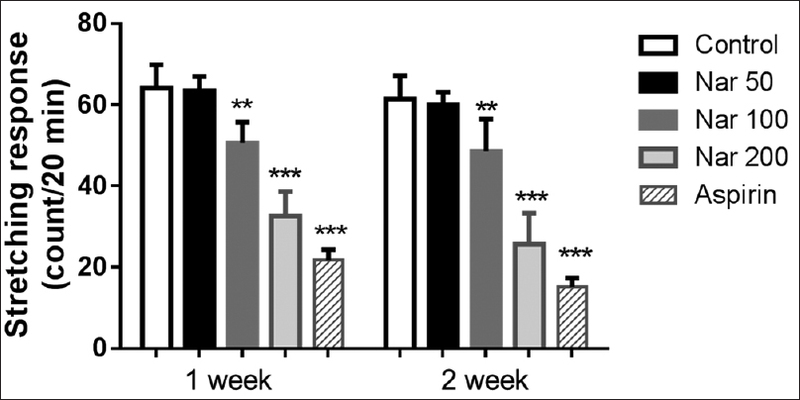 Consecutive oral administration of 100 mg/kg and 200 mg/kg naringenin for 1 week before the carrageenan injection resulted in a decrease in paw swelling for at least 5 h. The paw volumes were reduced by 16.2% and 37.7% in the 100 and 200 mg/kg treatment groups, respectively, by 3 h compared with the vehicle control group. Comparably, the standard pain-relieving drug, ibuprofen, used in this test as a positive control treatment, decreased edema by 59.4% at 3 h.
In the present study, we evaluated the potential antinociceptive and anti-inflammatory effects of naringenin through multiple pharmacological approaches, including the hot-plate test, acid-induced writhing test, tail-flick test, and carrageenan-induced edema. Our results showed that naringenin had statistically significant antinociceptive and anti-inflammatory effects in treated animals compared with vehicle control animals. To the best of our knowledge, our study is the first analysis to determine if naringenin can alleviate the nociception generated from thermal apparatus in addition to chemical-induced inflammatory pain. The hot-plate test has been utilized to evaluate the effects of centrally but not peripherally acting analgesics. The tail-flick test is another method to determine acute spinally mediated-nociception to thermal noxious stimuli. In spite of the similar purposes of these methods, it is hard to distinguish whether the pain-relieving perception of rodents resulting from naringenin is due to the peripheral or central nervous system. However, it is noteworthy that the thermal effect of analgesics in the tail-flick pain model is considered to be highly relevant to pain perception in humans . Carrageenan-induced paw edema is commonly used to test the anti-inflammatory and antiedema effects of natural products . The neurological nociception of carrageenan-induced paw edema is believed to be a biphasic event, which means that the sources of pain are from the irritation caused by the injection and from tissues compressed by accumulated edema by the end of the 1st h . It has been shown that the expression of cyclooxygenase (COX), which turns into prostaglandin as a major mediator of pain, can be provoked by carrageenan injection . Given that ibuprofen targets the inhibition of COX, we are convinced that naringenin might have a similar mechanism of action to exert its antinociceptive function. In addition, injections of acetic acid and carrageenan produce peripheral analgesic activity by eliciting bradykinins, prostaglandins, and proinflammatory cytokines such as interleukin (IL)-1β, IL-6, IL-8, and tumor necrosis factor-α, which then activate the chemosensitive nociceptors that excite the inflammatory cytokines ,,. Li et al. also demonstrated that naringenin could suppress lipopolysaccharide-induced inflammatory cytokines in our previous report . Anti-inflammatory activity might be one of the mechanisms by which naringenin achieves antinociception. Our results show that naringenin exhibits antinociceptive and anti-inflammatory effects via enforcing the pain tolerance of the neural system in vivo, providing a scientific basis for its application for alleviating pain and treating inflammatory disorders. Further detailed investigation is required to elucidate the mechanism of action. This research was supported partly by the Ministry of Science and Technology of Taiwan (grant no. MOST 106-2314-B-303-008-to Sen-Wei Tsai), and partly by an institutional grant from Taichung Tzu-Chi Hospital, Buddhist Tzu Chi Medical Foundation (grant No. TTCRD105-03 to Sen-Wei Tsai). Silva LM, Lima V, Holanda ML, Pinheiro PG, Rodrigues JA, Lima ME, et al. Antinociceptive and anti-inflammatory activities of lectin from marine red alga Pterocladiella capillacea. Biol Pharm Bull 2010;33:830-5. Lamont LA, Tranquilli WJ, Grimm KA. Physiology of pain. Vet Clin North Am Small Anim Pract 2000;30:703-28, v.
Kidd BL, Urban LA. Mechanisms of inflammatory pain. Br J Anaesth 2001;87:3-11. Stankov SV. Definition of inflammation, causes of inflammation and possible anti-inflammatory strategies. Open Inflamm J 2012;5:1-9. Wehling M. Non-steroidal anti-inflammatory drug use in chronic pain conditions with special emphasis on the elderly and patients with relevant comorbidities: Management and mitigation of risks and adverse effects. Eur J Clin Pharmacol 2014;70:1159-72. Sycha T, Anzenhofer S, Lehr S, Schmetterer L, Chizh B, Eichler HG, et al. Rofecoxib attenuates both primary and secondary inflammatory hyperalgesia: A randomized, double blinded, placebo controlled crossover trial in the UV-B pain model. Pain 2005;113:316-22. Badal S, Turfus S, Rajnarayanan R, Wilson-Clarke C, Sandiford SL. Analysis of natural product regulation of opioid receptors in the treatment of human disease. Pharmacol Ther 2018;184:51-80. Mir IA, Tiku AB. Chemopreventive and therapeutic potential of “Naringenin,” a flavanone present in citrus fruits. Nutr Cancer 2015;67:27-42. Mulvihill EE, Allister EM, Sutherland BG, Telford DE, Sawyez CG, Edwards JY, et al. Naringenin prevents dyslipidemia, apolipoprotein B overproduction, and hyperinsulinemia in LDL receptor-null mice with diet-induced insulin resistance. Diabetes 2009;58:2198-210. Assini JM, Mulvihill EE, Burke AC, Sutherland BG, Telford DE, Chhoker SS, et al. Naringenin prevents obesity, hepatic steatosis, and glucose intolerance in male mice independent of fibroblast growth factor 21. Endocrinology 2015;156:2087-102. Ahmed OM, Hassan MA, Abdel-Twab SM, Abdel Azeem MN. Navel orange peel hydroethanolic extract, naringin and naringenin have anti-diabetic potentials in type 2 diabetic rats. Biomed Pharmacother 2017;94:197-205. Lulu SS, Thabitha A, Vino S, Priya AM, Rout M. Naringenin and quercetin – Potential anti-HCV agents for NS2 protease targets. Nat Prod Res 2016;30:464-8. Park HJ, Choi YJ, Lee JH, Nam MJ. Naringenin causes ASK1-induced apoptosis via reactive oxygen species in human pancreatic cancer cells. Food Chem Toxicol 2017;99:1-8. Shi Y, Dai J, Liu H, Li RR, Sun PL, Du Q, et al. Naringenin inhibits allergen-induced airway inflammation and airway responsiveness and inhibits NF-kappaB activity in a murine model of asthma. Can J Physiol Pharmacol 2009;87:729-35. Moon PD, Choi IH, Kim HM. Naringenin suppresses the production of thymic stromal lymphopoietin through the blockade of RIP2 and caspase-1 signal cascade in mast cells. Eur J Pharmacol 2011;671:128-32. Chao CL, Weng CS, Chang NC, Lin JS, Kao ST, Ho FM, et al. Naringenin more effectively inhibits inducible nitric oxide synthase and cyclooxygenase-2 expression in macrophages than in microglia. Nutr Res 2010;30:858-64. Li YR, Chen DY, Chu CL, Li S, Chen YK, Wu CL, et al. Naringenin inhibits dendritic cell maturation and has therapeutic effects in a murine model of collagen-induced arthritis. J Nutr Biochem 2015;26:1467-78. Wang HK, Yeh CH, Iwamoto T, Satsu H, Shimizu M, Totsuka M, et al. Dietary flavonoid naringenin induces regulatory T cells via an aryl hydrocarbon receptor mediated pathway. J Agric Food Chem 2012;60:2171-8. Zhu L, Wang J, Wei T, Gao J, He H, Chang X, et al. Effects of naringenin on inflammation in complete freund's adjuvant-induced arthritis by regulating bax/Bcl-2 balance. Inflammation 2015;38:245-51. Wang CC, Guo L, Tian FD, An N, Luo L, Hao RH, et al. Naringenin regulates production of matrix metalloproteinases in the knee-joint and primary cultured articular chondrocytes and alleviates pain in rat osteoarthritis model. Braz J Med Biol Res 2017;50:e5714. Vittalrao AM, Shanbhag T, Kumari M, Bairy KL, Shenoy S. Evaluation of antiinflammatory and analgesic activities of alcoholic extract of Kaempferia galanga in rats. Indian J Physiol Pharmacol 2011;55:13-24. Zhao J, Fang F, Yu L, Wang G, Yang L. Anti-nociceptive and anti-inflammatory effects of croton crassifolius ethanol extract. J Ethnopharmacol 2012;142:367-73. Kothari S, Kushwah A, Kothari D. Involvement of opioid and monoaminergic pain pathways in Aegle marmelos induced analgesia in mice. Indian J Pharmacol 2013;45:371-5. Eddouks M, Chattopadhyay D, Zeggwagh NA. Animal models as tools to investigate anti-diabetic and anti-inflammatory plants. Evid Based Complement Alternat Med 2012;2012:142087. Annamalai P, Thangam EB. Local and systemic profiles of inflammatory cytokines in carrageenan-induced paw inflammation in rats. Immunol Invest 2017;46:274-83.